The original Uncharted came out at a time when Sony was struggling to sell consoles and desperately needed to keep the PS3 relevant, to show that Sony had first party games that could stand up and compete against Halo and Gears of War. The first game was clearly inspired by, and played like, a mash-up of four games that were popular at the time. Tomb Raider, Gears of War, Resident Evil 4 and Ico. A massive chunk of Indiana Jones was clearly wedged in there, too. It wasn't until Nathan "Nate" Drake's second outing that the series really found its stride and went into its own, with dynamic story beats and astonishing set pieces that the games it was inspired by would go on to replicate into their own games, going full circle. Chloe Frazer, voiced by the awesome Claudia Black (Farscape, StarGate) made her first appearance in Uncharted 2: Among Thieves and was instantly more interesting than Elena "last year's model" Fisher. She appeared again in Uncharted 3: Drake’s Deception but was oddly absent from the fourth game... probably so she wouldn't overshadow Nate and Elena's romance story. 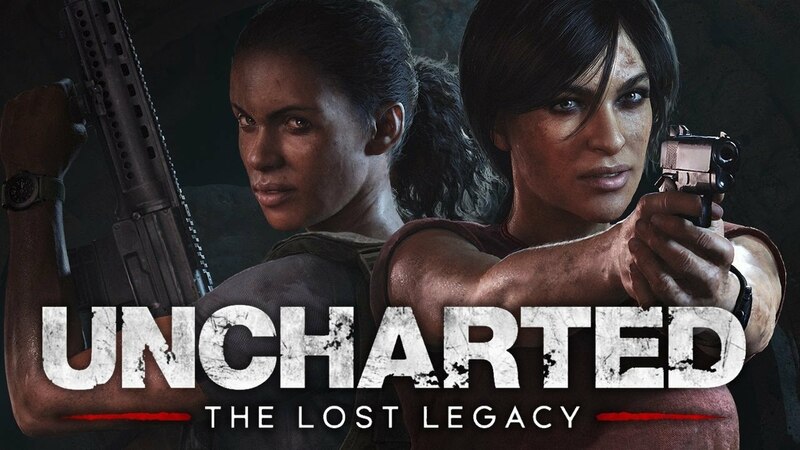 Originally planned as story DLC, Naughty Dog got carried away and made Uncharted: The Lost Legacy a full-blown spinoff. Set a little after the events of Uncharted 4: A Thief’s End, Chloe chases after the Tusk of Ganesh, a mythical Hindu artifact her father had been searching for; with the help of Nadine Ross, the former leader of the paramilitary organisation Shoreline and protagonist of Uncharted 4: A Thief’s End, they wander off to the Western Ghats of India, for their unlikely and fantastical adventure. For the most part, the game is still quite linear, fundamentally, you're only ever really heading from point A to point B. This time though, The game builds upon gameplay elements established in previous titles. Level traversal has been opened up for you to wander around, find alternative paths to take or walls to climb to get to your destination in a number of ways. Chapter 5 on the other hand, is the single largest, open area, map in any of the Uncharted games. This Chapter plays more like the Madagascar Chapter from Uncharted 4: A Thief’s End, with the return of the 4x4 and its magic winch. You'll find an optional mini side adventure during this chapter that’s worth doing if you're trying to find all the collectibles... which could also just be taken as filler to pad out the game's play time. Overall it feels like Uncharted: The Lost Legacy has fewer combat encounters than the previous games, with exploration taking the forefront. The stealth sections have had an overhaul, with the added addition of a silenced pistol, (Not quite sure why it was missing from Uncharted 4), or you can just charge in guns blazing and hope for the best. Enemy supply creates are littered about for Chloe to lockpick, being the thief that she is. These hide weapons, ammo and the occasional hidden treasure. Chloe and Nadine both seem a bit more scrappy, than Nathan and his many sidekicks, and have some really cool double team take-downs. Nadine maintains her ‘not messing around’ persona and won't hesitate to fight or take out a guard in your way, without you. Uncharted 4's Multiplayer also makes a return with a few added modes. Survival Arena Mode plays like most Horde modes, hold down an area and take out each wave of incoming enemies for as many rounds as possible. By far, best played with a friend... or at least someone willing to communicate online. Naughty Dog has got very good at telling story driven games and then implementing aspects of gameplay around them. The shorter length of Uncharted: The Lost Legacy helps the game feel a bit more focused, with the intention to tell its story. As great as the fourth game was, it did feel a little too long. (Seems strange complaining about too much of a good thing).